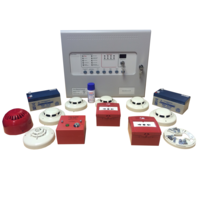 There are three Premier Elite fire alarm kits available in either a 2, 4 or 8 zone versions. Each kits comes complete with a panel (including batteries), 6 detectors (including bases), 2 manual call points, 2 sounders and a smoke detector tester. Buying this equipment as a bundle offers a considerable cost saving (approximately 15%) and this configuration can easily be expanded by adding additional devices from our catalogue.